Brief Synopsis – Four cars of people encounter a dying man who tells there where a cache of money is hidden causing them to race against each other to be the first to find the money. My Take on it – This movie is truly a who’s who of comedy in the early 60’s. 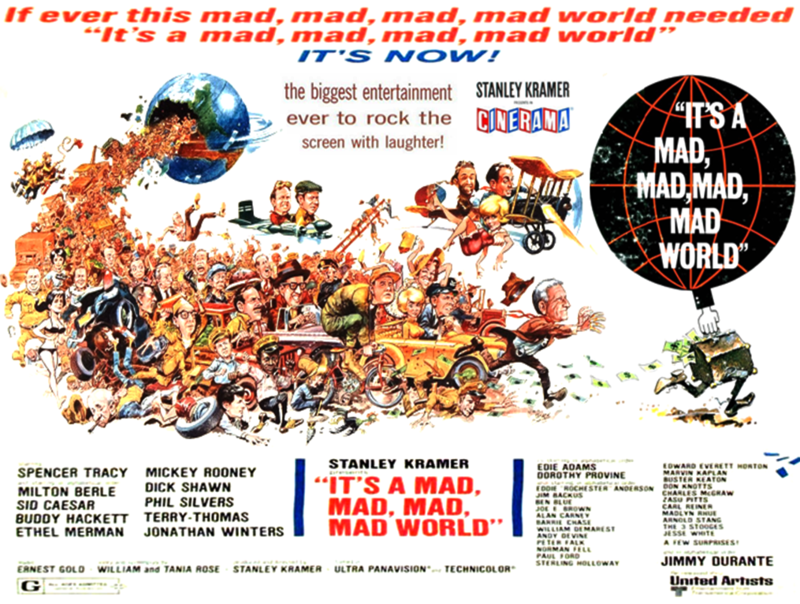 Producer Stanley Kramer went out of his way to get as many comedians to star in the movie or to have a cameo as he could. This list is so long that I won’t even start to list them here. In order to appease as many of the actors as possible the opening animation actually shuffles the names of the main cast so many times in order to give each and every one of them top billing for a few seconds. Most of the main actors had their own TV shows at the time, so most of the filming was done during the summer TV filming hiatus in order to get as many days filmed as possible. They were even able to get the Three Stooges to film a 5 second cameo as 3 firemen. The premise here is simple and genius; 4 cars witness another car crash and when they go to help the driver, he tells them that he buried $250,000 and that they can all split it since he is dying. All 4 carloads then race to get there first to find the money. Along the way, they all meet up with other people who ultimately also get involved in the search. They are being followed by a police detective the whole time who has been trying to catch the thief for years. This movie is hilarious and I laugh at so many scenes each and every time I see it and the jokes never get too old. Bottom Line – Hilarious race to grab the loot. Unbelievable cast and cameos galore is a who’s who of comedy in 1963. Highly recommended! Definitely a hilarious movie. Its crazy from start to finish. And you’re right – everyone is in it! absolutely nuts (but in a great way). Thanks for stopping by and commenting Mikey! Nice review! I should watch this one… 🙂 Sorry I fell behind again – will catch up on reading here this week! You definitely should see it!